Just in time for Sony's big headliner racing title, Thrustmaster has announced the T300 RS racing wheel. With the first big racer for the PlayStation 4 around the corner, this is the perfect time to release a new wheel. I spoke to Thrustmaster Spokesman Michael Peterson to talk about the wheel and about getting into racing wheels in general. The wheel has some cool features, including a couple specific to this model. First and foremost, the wheel is not only PlayStation 4 compatible, but PlayStation 3 and PC as well, opening a wide swath of compatible racing titles to enjoy the wheel with. The wheel has internal memory and firmware, and the firmware can be upgraded by connecting it to your PC, similar to other gaming peripherals from the last few years. The headset I use has seen big jumps in performance with Sony and Microsoft's new consoles thanks to firmware updates, so I expect we could see improved functionality with the wheel as well. The biggest feature is that the wheel's rotation 270° all the way up to 1080° depending on the type of vehicle you're driving – those super cars and Formula One cars are a little different from the average street car. This is done automatically by the game, and it's something Peterson says they see not just in simulation racers but in more arcade-focused titles as well. For the most committed racing fans, especially those that have invested in other Thrustmaster products, it's worth noting that the wheel base is compatible with other Thrustmaster wheels, as well as some accessories, listed in the press release below. I chatted with Peterson a bit about some of the hurdles consumers face with wheels like accessories like this. The price is it's own thing, but even if you can dig anywhere from $150 to thousands of dollars out of your couch cushions, there's still the matters of space and the learning curve. "The number one thing, even for me making this transition," Peterson said, "was to be really open to the experience first and foremost. You will not be the best racer immediately… you're not going to get the same results right away. Read the manual – It sounds crazy! – but look at the configurations, what the wheel offers." As for space, the T300 RS, like other wheels from Thrustmaster and some other accessory creators, comes with options that allow you to mount it to just about any flat surface. Peterson recommends checking out videos people post on YouTube of the various setups they use. The T300 RS is set to release in North America before the end of September for $399.99. 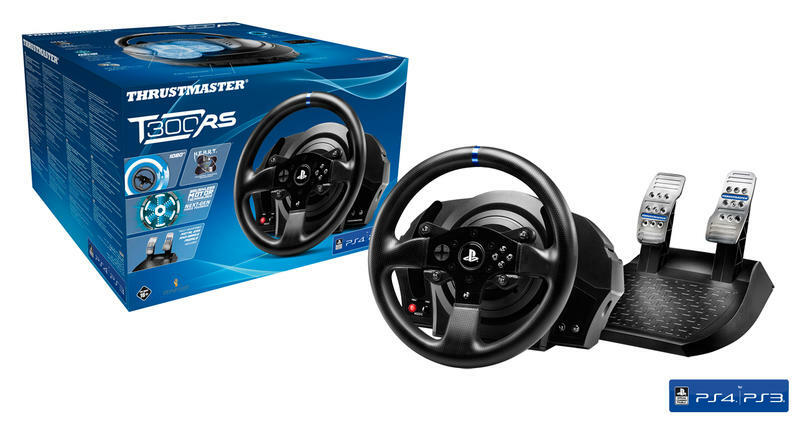 New York, September 17, 2014 — Thrustmaster is proud to announce its brand-new Next-Gen racing simulator, officially licensed for the PlayStation®4 system (PS4), PlayStation®3 system (PS3) and PC compatibility. It's the perfect time for racing enthusiasts to put the pedal to the metal during this back-to-school season! Thrustmaster assists virtual racers through their learning curve with the T300 RS. This forcefeedback wheel allows gamers to really take the plunge into the world of racing, and hone their driving skills for a better performance. In order to achieve this Thrustmaster has taken great care to create the perfect solution for any gamer trying to go to the next level in their racing games. The T300 RS provides an unrivalled immersion, for a pure connection with the road. Under the hood there's nothing less than a genuine brushless servo industrial Force Feedback motor (with frictionless action), combined with a new 1080° dual-belt system to deliver the never seen super-smooth and quiet Force Feedback with incredibly responsive, realistic Force effects to really feel the road (Feel the road, don't feel the racing wheel inner mechanical structure).The silence of the motor allows you to really focus on what matters, which is premium performance on the road.Thrustmaster's development teams have added precision to the motor's impressive capabilities by incorporating H.E.A.R.T HallEffect AccuRate Technology®, featuring a contactless magnetic sensor: this provides 16-bit resolution, for 65,536 values on the wheel's steering. The T300 RS also features an internal memory, upgradable firmware so that users will always have access to the latest improvements via the wheel's PC compatibility, and a PS4/PS3 sliding switch on its base for optimal compatibility with both systems. The T300 RS includes a detachable wheel, featuring the Thrustmaster Quick Release system: the wheel measures 11 inches in diameter, with brushed metal central spokes. Its official PS4 buttons (PS, SHARE, OPTIONS) lets users access the system's new social functions at any time. The T300 RS weighs in at approximately 2.6 lbs, for ultra-realistic inertia and Force Feedback. The wheel's entire circumference features reinforced textured rubber cladding, for the ultimate in comfort. 2 large sequential paddle shifters are attached to the wheel: they're 5 inches in height for easy access, and 100% metal. The wheel's angle of rotation can be adjusted from 270° to 1080°, depending on the type of vehicle being driven in the game! What's more, the wheel is interchangable with other Thrustmaster wheels (the Ferrari F1 Wheel Add-on*, Ferrari GTE Wheel Add-on* and T500 RS GT Wheel*). The T300 RS's pedal set features metal pedals with a long range of travel, which are fully adjustable in both height and spacing – with 6 different possible positions per pedal. The brake pedal even features progressive resistance. FEEL THE ROAD AS YOU NEVER HAVE! The T300 RS is also compatible with the Base Fixed Paddle Shifters kit* (allowing users to install stationary paddle shifters on the wheel's base), Thrustmaster's 3-pedal pedal sets (T3PA* and T500 RS*), and the TH8A* and TH8RS* shifters. Establishing the new reference in racing wheel simulation Gear!